The interesting thing about music therapy is that nobody I could find understands how it works on the brain — just that it does. The subject is newsworthy right now because former Rep. Gabrielle Giffords, who was badly injured in a Tucson, Ariz., shooting a year ago, apparently recovered her speech though music. Scientists, doctors and therapists all say that music helps brain trauma victims develop new pathways around damaged areas of the brain. “I think what we find in people that have had brain injuries — sometimes it’s easier for them to sing words rather than to say words,” said Eric Waldon, a music therapist at the University of the Pacific. Practicing healers seem less concerned about what happens in the brain than with the shifts in attitude and outlook — and the joy — it can bring about in patients. 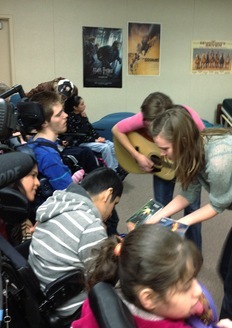 At a class I visited in Stockton, Calif., for severely disabled adolescents, two would-be music therapists worked to engage their patients in dialogue, singing or motion. The young therapists were in their junior year at the University of the Pacific, and they were singing Beatles tunes while strumming an electronic instrument called an omnichord. The hard-to-reach kids took a long time to acknowledge the visiting musical therapists, but they eventually seemed to come around. They smiled, gave the therapists high fives and strummed the omnichord to make music of their own. For these kids, the interactions were encouraging, though certainly not a solution to their overwhelming problems. Music therapy gained popularity after veterans used it following both World War I and World War II. 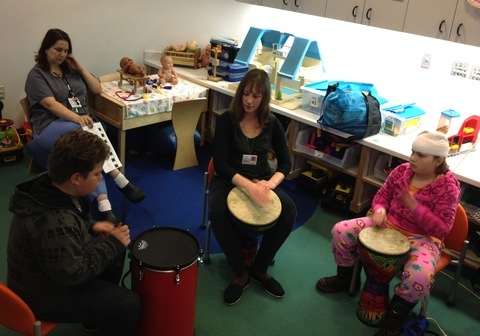 Today more than 70 colleges and universities offer music therapy programs. Students who pass an examination process receive certification from a professional board. Much of the research on music therapy’s effects seems to say it often works in reducing anxiety and pain, distracting distressed patients and helping normalize blood pressure and breathing. That might seem obvious; music has a lengthy history of soothing the savage breast. But music therapists say that although music itself will calm people down (or excite them, depending on the type of music), actual music therapy differs from leisure listening or instrument playing. “It isn’t ‘Johnny went to choir, and Johnny got better.’ It’s that Johnny has a music therapist and together with the music therapist he got better,” Waldon said. Trained therapists learn to find ways to engage their patients, to pick the right tunes or instruments, and to get their subjects involved. They can encourage improvisation and promote learning through music. In many cases, therapists work one-on-one with patients and tailor therapy to that patient’s needs and musical tastes. But Waldon noted that although engaging in music through square dancing or listening to your iPod may have a therapeutic effect, it’s not therapy. “The term therapy itself says that there’s a therapeutic relationship and there’s an intentional use of music to address non-musical goals,” he said. Is that splitting hairs? Maybe not. Therapists and scientists studying music’s effects continue to explore how music changes the brain and impacts health, and they hope to eventually develop therapies that are more effective, more targeted at curing — or at least easing — some of mankind’s ills. Turn in to Monday’s NewsHour broadcast for Spencer’s full story on how music therapy can help the brain recover from disability or trauma.